This is my place where I can share everything that I have made. 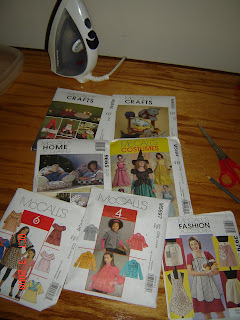 Ever since I joined Crazy mom quilts sew along i have become obsessed with scrap projects. i am on week seven now. I think that puts me at about 52 blocks total.. I guess I need to get busy! 1 block down, alot more to go. 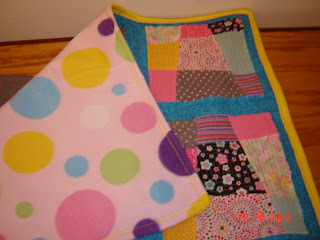 And because 2 Quilting projects and a lot of other smaller projects are not enough, I am also making a picnic quilt/blanket using the whirlygiggle tutorial on greeting arts. I feels so good to use what I already have. I'm sure there will be alot more scrap projects, but I think (and my husband will agree) that I need to finish the ones that I have already started. I took along break from posting. I'm not really sure why. I not really sure if I'm that interesting. I love reading every ones blogs and getting a lot of inspiration for everyone. I think I'm going to continue with it and maybe the more post I make the better at writing I will get. 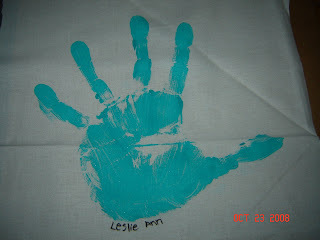 It has her hand print in the middle and and then on either side of her is her daughter( my Aunt) and her son(my dad) The rest are her Grandchildren and her Great Grandchildren. That is my Grandmother in the picture and of course me. We took this picture when I gave it to her. She took it from there and delivered it to her friend who was in the States visiting. but the finished product was so worth it. This is my son, he had been waiting a long time for this quilt. Everyday he would ask me if i was going to work on it. He took it from my hands about 2 seconds after I made the last stitch on the binding. I makes me so happy when they love the thing i make for them. I can't wait to see how this quilt turns out. This is it before i put the binding on. I put a red binding around it and even made my own label. It was just too perfect for her. I have also been working on some other things for some people. 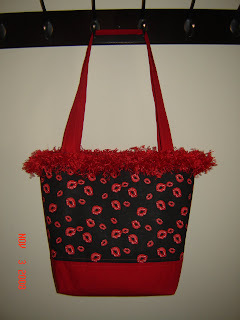 I made this cute Lips bag for a friend of my Aunt who works in the Rodeo. She is in a Group Called the red lips, or something like that. Red Lips fabric is almost impossible to find. This is actually a bandanna that I found at Joanns. I have to make 5 more of these for the rest of the ladies in the group. Here is a sneek peek at what I'm working on now. I have already started making Christmas presents. Too Early? I usually end up waiting until the last minute (I work really well under pressure) to start a gift and them I'm stressed and worn out by the time I'm finished. 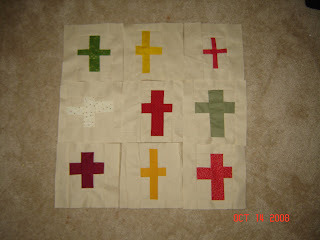 Since I have recently started to venture into the world of Quilting, I thought I would make a few quilts this year. I get alot of my inspiration from everyone's blogs and seeing their work. 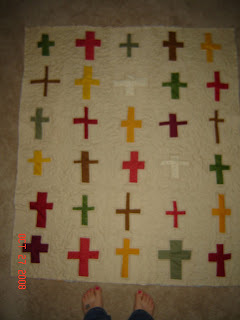 I saw this Quilt on Crazy mom Quilts and just new that it was going to be perfect for my Aunt. this is what I have done so far. 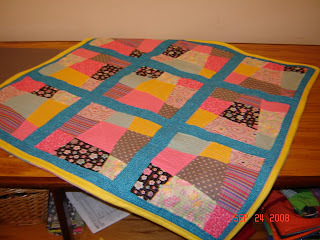 It is very different from the one on Crazy mom quilts but I hope the overall effect is going to be the same. I love it already. I just started quilting and have already fallen inlove with it. This quilt is made of all my scraps. I just love it. It was my first attempt at free motion quilting and I would have to say I'm pretty surprised with how it turned out. 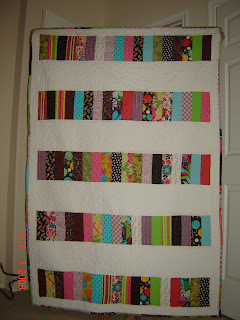 I had alot of tension problems that I did not discover until I had already quilted a good portion and I was not about to go rip it out. I just kept telling myself that this is the first one, It is not going to be perfect. Last week Hobby Lobby had all their McCalls patterns on sale for $.99. I did not really need any but when they are cheap, why not. these are the ones I bought. Emily made out the best with a pattern for some new shirts and jackets. I've been wanting the vintage apron pattern for a while now and just could not bring myself to pay $15.00 for it. I really liked the little jacket, so I made one for Emily the other night. Isn't she the cutest ever. I'm not sure what happened with the placement of the button holes. I did not notice them until it was too late and they were already cut. Oh well, I am going to make her the long sleeved one next in red and maybe put in a satin lining. I know she will like that. Joe's friend's wife is having a baby so I wanted to make something for her rather than just go buy something. 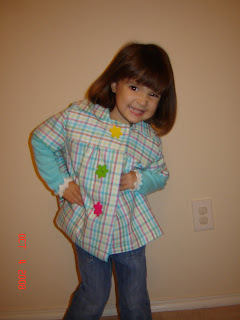 I found this tutorial for a really cute baby quilt at www.ohfransson.com She gives very clear and easy to follow instructions which made it very simple to make. 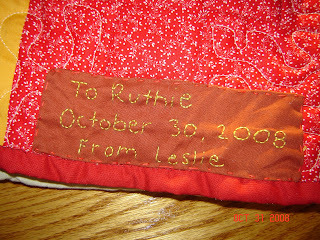 I left out the giraffe on the front because I did not have anything in my fabric stash to make it out of. Im very pleased with how it turned out and can not wait to give it to them.